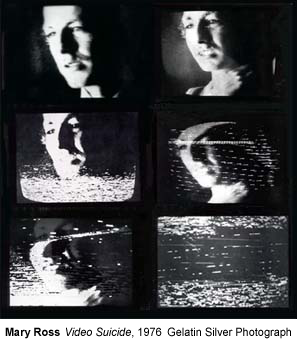 While many artists were exploring video’s time-based characteristics in the early 1970s, Mary Ross began using the video synthesizer and computers at the Experimental Television Center in upstate New York to produce still images on film. The video synthesizer functioned as a type of electronic darkroom. Her own slides, negatives, prints, movie film and videotapes provided source material. Positive and negative images could be made instantly by flicking a switch. Video keyers created high contrast effects similar to Kodalith film. Colorizers added color to black-and-white negatives and mixers enabled her to superimpose images from multiple sources. The effects of video image processing were cumulative. Mary could manipulate images electronically and see the effects of each change on the TV screen as it occurred. Since printers that are common today were non-existent, crude, extremely expensive or likely to be in the hands of government, science or industry, she would photograph the results from the TV screen onto color or black-and-white film with her 35mm camera, either accepting the image as is or manipulating it further in the darkroom.